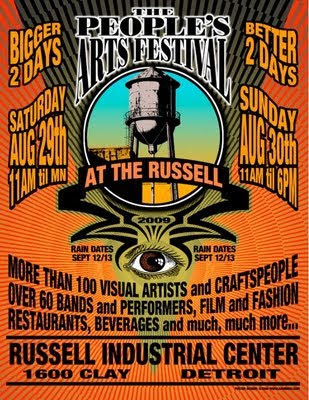 The People's Arts Festival is open today until 6pm so go down and check out the fabulous artists and musicians there we had a great time and bought up a ton of rock historical art, jewelry and much more! Machinegun Thompson attended the People's Art Fest this weekend and ran into old friend Johnny Bee Badanjek of the famous Detroit Wheels Retro: Kimmer was on hand to film this once in a lifetime meeting of the legendary Detroit Music Drumming Titans. He was kind enough to give me a copy of his one of his self portraits. We still have more work to do together in the future when he can find some time. 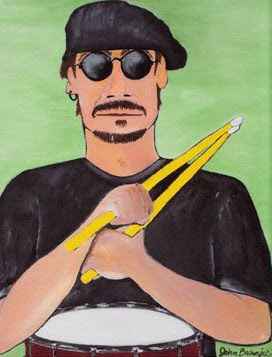 He is playing in two bands right now, and finishing a 5’ by 5’ painting, while taking care of his mother. Boy, can I relate! We had so much fun we were laughing till it hurt. Johnny was so easy to interview, I could just relax and go with his flow and glow. The man hasn’t changed one bit. He is still charming, funny, intelligent, witty, and a blast to hang with. Thanks Johnny. Till the next time my great friend! "It was good to see Dennis (Machine Gun) Thompson at The People's Art Festival telling some tall tales about his legendery days with the MC5. Everybody was there asking where's Dennis? Greasy Carlisi from Robert Gorden and Circus Boy who rocked the crowd. Martin (Tino) Gross of the Howling Diablo's who sat in and played a fine set with Vivian George. And out from the pass droping by Mike from Rhythm Core. Alright everybody. Ah..one..two..Ah..one ..two..three..Four."